What? Jonathan Edwards comes to the aid of annihilationism? Why would I say that? We all know Jonathan Edwards didn’t believe annihilationism, right? Yes, we do all know that, but he gave us a helping hand anyway. Some advocates of doctrine of eternal torment make the mistaken claim that just because the Bible uses the phrase “eternal punishment,” it must be taken to teach eternal torment. The falsehood of this assertion is fairly obvious and it’s not like a lengthy argument is needed to put it in its place. 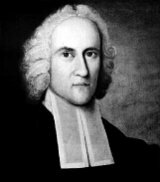 But what’s interesting is that Jonathan Edwards, one of the most memorable preachers on the lurid details of eternal torment and who emphatically rejected annihilationism, came to the aid of annihilationism just at this point in the argument, in a chapter entitled, “Concerning the Endless Punishment of those who Die Impenitent,” paragraph 31. On this, I would observe that there is nothing got by such a scheme; no relief from the arguments taken from Scripture, for the proper eternity of future punishment. Although Edwards himself thinks the scheme (annihilationism) is mistaken, this is not his point here. He says here that there is nothing got by the scheme itself (in other words, even within such a scheme, regardless of whether or not it is true) that brings relief from the Scriptural teaching that future punishment is eternal. I know that in the past when speaking about the many mistakes made by traditionalists who critique annihilationism, I’ve used Robert Peterson as an example. I even had a paper published, pointing out the mistakes in his case. People are going to think I’m picking on the poor guy. I swear, I didn’t set out in this post to critique him, but in looking up quotes, I discovered an absolutely blatant error, and it’s an error that will, in the mind of the those who believe Peterson, impugn the work of another man (Edward Fudge), so what the heck, here goes. This is all wrong, and I am at a loss to charitably imagine how Dr Peterson can say this after actually reading the chapter in question. Edwards explicitly states that in the scheme he is now considering, the lost are not annihilated. No, this is universalism, a view in which the lost are eventually delivered to enjoy eternal happiness. It is after discussing problems internal to this view, and not annhilationism, that Edwards uses the words that Peterson erroneously quoted, at the end of paragraph 32, “so this scheme overthrows itself.” Oops. Peterson claimed that this statement was the conclusion of an argument for the claim that only eternal torment is properly a punishment that is eternal as a refutation of annihilationism. But not only did Edwards not even present such an argument in chapter 31 when talking about annihilationism, this comment was not even written in reference to annihilationism but rather to a version of universalism. I can’t imagine getting a rebuttal more badly wrong. I do not accuse Fudge of impure motives here. He errs because of his zeal for annihilationism and his consequent tendency to read that doctrine into the words of historical (as well as biblical!) writers when it isn’t there (Two Views of Hell, 90). So in other words, Fudge is allegedly reading Edwards with too much haste and too little care because he’s a little too willing to find his conclusions there? The irony is palpable, given the nature of Peterson’s error, which seems to be the result of a failure to adequately grasp Edwards’ point in the first place, and then a mistaken citation made for no other reason than too much haste and too little care. A bit too much “zeal,” perhaps? Next Next post: The Pope: Do They Love Him or Hate Him? Hell (as a place of unending torment) is a teaching, like purgatory, that has no basis in scripture. It is a tradition that has become orthodox, but scripture as in most cases runs contrary to traditional viewpoints. Life is a gift … we are not owed life, but we each have it for a time. But it is inherently TEMPORARY … having a beginning and an end. The doctrine of hell depicts no end … no “PERISHING” … but continued and unending conscious torment. In reality, to accept the very Life of God is to be made alive by His life … a Life that is unending and unbeginning .. .ETERNAL. To reject that Life is to remain temporal … having no Eternal destiny. The serpent said: “You shall surely not die.” … and the church has been repeating the refrain, even when such teaching goes against the most popular verse … John 3:16. My problem is a matter of perspective, yet is sufficient to give me pause in agreeing with any Statement of Faith that promotes the idea of damnation as unending conscious punishment. Primarily, it is against the flattering (and consistent with New Age,) and unbiblical philosophy of the “universally eternal” human soul. I believe that the way that most Christians talk about this aspect of their faith leaves room for a perspective that goes against the whole of scripture. There is coming a “last day” as it is written, in which “heaven and earth will pass away” or “be destroyed.” The point is that the punishment is beyond the duration of those punished. It is like a man given 5 consecutive life sentences … we are smarter then to think that such a man will automatically live five times as long then before his sentence. Rather, we intuitively know that he will not last until the duration of the sentence. So, when I read that there will be an “eternal punishment” for the damned, I do not believe that the damned have the eternal life needed to last in a perpetual conscious state nor withstand the fire longer then anything else in creation. Nor do I think God so cruel as to torment them until the time of breaking, and then waken the faint and mend their wounds so that He could torment them again, and once they break from that torment to bandage again and awaken them again just so that He could torment them some more. Surely, this is not consistent with any of scripture, yet that is the implication of saying that they will “suffer everlasting conscious punishment.” Nor is it logical to say that those that LACK eternal life, will somehow be able to live eternally!?!? In Dallas we have a monument called the “eternal flame.” It isn’t really eternal, but for argument’s sake, lets say that it really is. Now, if I take a blade of grass and put it in the fire, does the blade of grass become eternal or is it destroyed? This is quite obvious. The eternal fire does not make everything eternal that is exposed to it … Rather the eternal fire destroys everything that is not likewise eternal. Hence, when one reads in scripture about everlasting destruction, one should not assume that whatever is destroyed becomes everlasting. That would be illogical and counter-intuitive. However, that is exactly what Christians are saying when they talk about unending conscious torture. Essentially, I gather that a prevelent myth is saying that every soul is indestructible / immortal and has everlasting life … even those in the Eternal Fire subjected to the damnation. HOWEVER, immortality and everlasting life is a promise of the Gospel. What an empty offer that would be if everyone already had that! Christ’s accomplishment on Calvary would have been in vain. “Fear the One that can destroy your soul.”- Jesus, speaking of the Father. “Fear the One that would torment you til you pass-out, and then awaken you for more torment until you pass out, and on and on without an end. He couldn’t destroy an immortal everlasting soul of the damned even if He tried.” – Christians, while talking about the Father. What I meant is that the error that Peterson has made here will, in the eyes of the reader, impugn you, because it makes it look like you’ve been sloppy in your reading of Edwards, when actually you haven’t. Maybe I should re-word that to make it clearer. This is a great presentation of the view of annihilationism. If you have 49:00 minutes, well worth the time! Jeffry, who is that speaking? Just to clarify, Glenn… When Jonathan Edwards made the point that annihilation “would itself be eternal punishment”, as you paraphrase him, he wasn’t putting this forward as a possible interpretation of passages such as Rev. 11.14 though, was he? That is, Edwards was merely pointing out that annihilationists do not avoid “eternal punishment” altogether, as there is still an “eternal punishment” of another kind (eternal non-existence), wasn’t he? Right Deane, he never entertained annihilationism as a plausible interpretation. He just confirmed what a number of annihilationists say when they point out that annihilationism would still be an eternal punishment of some kind.